Since the beginning of the 20th century, the production of graphic and visual media, whether in the form of books, magazines, tourist guides, albums or photobooks, plays an important role in the world of both collective and individual editorial projects. It is therefore important to inquire about the production of such multi-layered visual and textual artifacts, in which the practices of drawing, engraving, painting or photography practices may converge into innovative editorial strategies and modern dynamic forms in order to capture new readers. 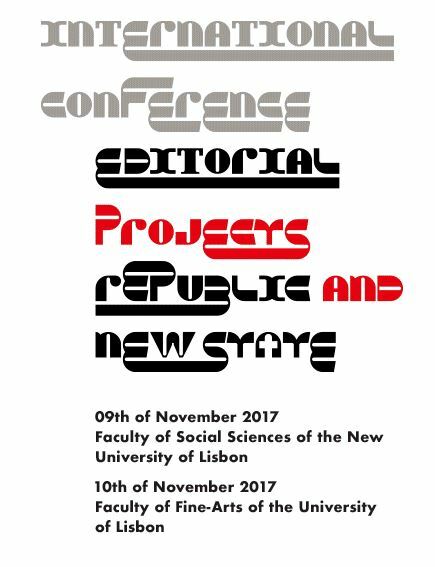 In Portugal, significant editorial projects were born during the early 20th century Republic, such as Orpheu (1915) or Portugal Futurista (1917). The emergence of graphic experimentation and image-based information generated new forms of artistic advertisement, establishing new word-and-image interactions. The magazine Ilustração Portuguesa initiated in 1906 used photography in an unprecedented way. In the 1920s appears the cult of the magazine and emerge women’s fashion magazines such as Voga (1927) or Eva (1925-1989). In the rising mass society of the 1930s, Notícias Ilustrado (1928-1935), was the first magazine to be printed in rotogravure. Meanwhile, at the service of the Estado Novo propaganda, the publications promoted by the Secretariat of National Propaganda (SPN), directed by António Ferro would leave countless examples of editorial projects among magazines, such as Panorama, Revista de Arte e Turismo (1941-1974) or the colonial Mundo Português (1934-1947), or photographic albums, such as Portugal 1934 and Portugal 1940, as well as books, guides or exhibitions catalogues. In the 1960s and 1970s, the Almanaque magazine (1959-1961) or a photographic album, such as Um País que importa conhecer (1972), were examples of the graphic potentialities of these years. Parallel to the regime’s propaganda, hard censorship seriously affected freedom of speech. However, other editorial projects appear as important counter-images and counter-discourses. As Mulheres do meu país, written by the feminist Maria Lamas in 1948 was an early example; and in the following decade, the photobook Lisboa, Cidade Triste e Alegre (1958), by Costa Martins and Vitor Palla, were testimonies of the new times.